at the Christmas party hop. Ev'ry couple tries to stop! I'm a wee bit excited for December 25th, plus, I'm going to the city today... finally. The boy and I are doing the touristy Xmas things: see the tree, possible ice skating, window shopping at Saks, etc :) and then we're headed over to Pomaire for an authentic Chilean dinner. I cannot wait for him to try! Above is my wintery reality by the way :). I fell asleep very early last night, around 8, it's a bit embarassing, lol. Beforehand though I had dinner around 7 with the fam. I think the sleepiness interfered with hunger because I totally didn't want to eat, I half of the sweet potato, everything else pictures, and passed on the chicken breast. 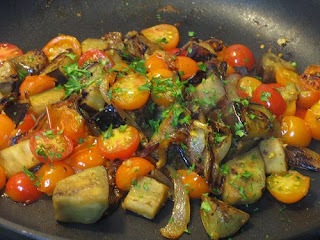 The veggies were really good and simple, cooked in a little EVOO, garlic, and spices. Yum yum yum! About 12 hours later, I awoke and finally felt well-rested ;). I started my day with a bowl of Multibran Flakes with added flax, skim milk, and banana. I also had a clementine on the side and am sipping a mug of Green Tea as I type. It's one of my last days helping my mom so I've gotta work before heading into Manhattan. Happy Monday bloggies!